The Blue Cash Everyday® Card from American Express is good for people with Excellent/Good credit who frequently spend on groceries, specifically $3,167 or less a year. At this spending, you’ll earn one of the highest rates on grocery purchases of any card in the CompareCards database (second only to the Blue Cash Preferred® Card from American Express). Also, if you’re looking to complete a balance transfer or make a large purchase, this card has a good intro period at 0% for 15 months, then 15.24%-26.24% Variable APR for you to get your finances in check. This card isn’t designed for people who are big spenders in grocery ($3,167 or more annually). Big spenders are better off with the Blue Cash Preferred® Card from American Express, which earns a higher cash back rate for U.S. supermarket spending, and although there is an annual fee, spending over $3,167 on groceries will outweigh the fee. If you want to earn cash back but aren’t a frequent grocery shopper and don’t spend on gas or at select department stores, you won’t reap the full benefits from the cash back rewards this card offers. You may be better with other cash back cards. Also, if your primary goal is to complete a balance transfer, you can find better balance transfer cards with longer 0% intro periods, and cards that offer $0 intro transfer fees. The Blue Cash Everyday® Card from American Express offers a great rate for frequent grocery shoppers: 3% cash back at U.S. supermarkets (on up to $6,000 per year in purchases, then 1%). 2% cash back at U.S. gas stations and at select U.S. department stores. 1% cash back on other purchases.. A benefit of this card is that the higher rate categories don’t rotate — they’re consistent throughout the year and no activation is needed. American Express also provides you with great added perks (exclusive entertainment access, free ShopRunner membership) that make this card worthwhile beyond the cash back program and 0% intro APR period offer. Although the cash back rate is great, the Blue Cash Everyday® Card from American Express has yearly maximums on the cash back you earn from U.S. supermarket spending. This can create limits on your higher cash back earning potential, depending on how much you spend in the high-rate categories. Regarding the 0% intro APR period, it is average in comparison to other cards, but you can find cards with longer offers. There is a balance transfer fee that can cost you a few hundred dollars if you transfer a large balance: (Either $5 or 3% of the amount of each transfer, whichever is greater. Some cards offer significant savings with more favorable transfer fees, like the Chase Slate®. Global Assist® Hotline: Traveling more than 100 miles from home qualifies you for 24/7 access to the Global Assist® Hotline. This feature offers various services that range from medical, legal, and financial information to select emergency coordination and assistance services. You’re responsible for the costs charged by third-party service providers. Roadside Assistance Hotline: If you’re in the U.S., Canada, Puerto Rico or the U.S. Virgin Islands, you can qualify for emergency services like towing, changing of a flat tire or a battery boost. Third-party service costs are your responsibility, and there are some vehicle and road exclusions. ShopRunner: With over 140 online stores, you can receive free two-day shipping on eligible items. Exclusions apply; learn more at shoprunner.com/amex. Exclusive entertainment access: One of American Express’s better-known benefits is exclusive access to ticket presales and cardmember-only events in select cities. Events include: Broadway shows, concert tours, family and sporting events, and more. Fraud protection: You won’t be held responsible for any fraudulent charges. To get the most out of your Blue Cash Everyday® Card from American Express, make sure you use it on all U.S. supermarket purchases, as well as U.S. gas station and select U.S. department stores so you earn the high rate on those transactions. If you want to earn the sign-up bonus, make sure you complete the required spending in the given time frame: $150 statement credit after you spend $1,000 in purchases on your new Card within the first 3 months.. If you plan on completing a balance transfer or financing a large purchase, make sure you do so as soon as possible (within 60 days for the balance transfer offer). Once your transfer or purchase is complete, make frequent on-time payments with the goal of paying off your balance before the intro APR period is over. This way you won’t be charged the 15.24%-26.24% Variable interest once the intro period is over. The total amount of your balance transfer request, including fees and interest charges, cannot be less than $100 and cannot exceed the lesser of $7,500 or 75% of your credit limit. For example, if your credit limit is $20,000, your transfer can’t exceed $7,500, and if your limit is $5,000, your transfer can’t be more than $3,750. Simply multiply your credit limit by .75, and if the value is less than $7,500, that is the maximum you can transfer, otherwise your maximum is $7,500. Your balance transfer must be completed within 60 days from account opening in order to take advantage of the $0 intro balance transfer fee and 0% intro APR period. You can complete your balance transfer by calling the number on the back of your card or online by going to americanexpress.com/balancetransfer. Have the account number and balance of the card with the debt ready. Your transfer usually takes five to seven days, but in some cases it may take up to six weeks. Also, transfers won’t be processed until at least 10 days after account opening (giving you time to change your mind). The Blue Cash Everyday® Card from American Express offers a cash back program with 3% cash back at U.S. supermarkets (on up to $6,000 per year in purchases, then 1%). 2% cash back at U.S. gas stations and at select U.S. department stores. 1% cash back on other purchases.. This card is great for grocery spenders, especially those who spend $3,167 (or less) a year on groceries. We explain why this is the key amount in our comparison to the Blue Cash Preferred® Card from American Express below. Cash back is received in the form of Reward Dollars that can be redeemed as a statement credit. In addition to a cash back program, there is a good intro bonus that allows you to earn extra cash back within the first few months of account opening: $150 statement credit after you spend $1,000 in purchases on your new Card within the first 3 months.. The Blue Cash Everyday® Card from American Express and Blue Cash Preferred® Card from American Express are comparable cards that both offer higher rates on spending at U.S. supermarkets and U.S. gas stations. However, they differ in rewards rate, annual fee and 0% intro APR offers. The Blue Cash Everyday® Card from American Express offers 3% cash back at U.S. supermarkets (on up to $6,000 per year in purchases, then 1%). 2% cash back at U.S. gas stations and at select U.S. department stores. 1% cash back on other purchases. The Blue Cash Preferred® Card from American Express offers 6% cash back at U.S. supermarkets (on up to $6,000 per year in purchases, then 1%). 3% cash back at U.S. gas stations, 1% cash back on other purchases.. You may be tempted by the higher rates of the Blue Cash Preferred® Card from American Express, but be aware of the annual fee. 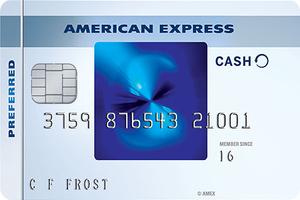 While the Blue Cash Everyday® Card from American Express has a $0 annual fee, the Blue Cash Preferred® Card from American Express has a fee — $95. Factoring in the annual fee (or lack of) for each card, we’ve narrowed down who each card is best for. If you spend $3,167 or less a year in groceries, the Blue Cash Everyday® Card from American Express is a better fit. That’s because $3,167 is the break-even point where you will start to see more cash back with the Blue Cash Preferred® Card from American Express, making this card a better choice for big grocery spenders. See below for a breakdown of the key elements of both cards. Balance Transfer Fee Either $5 or 3% of the amount of each transfer, whichever is greater. Either $5 or 3% of the amount of each transfer, whichever is greater. Rewards 3% cash back at U.S. supermarkets (on up to $6,000 per year in purchases, then 1%). 2% cash back at U.S. gas stations and at select U.S. department stores. 1% cash back on other purchases.. 6% cash back at U.S. supermarkets (on up to $6,000 per year in purchases, then 1%). 3% cash back at U.S. gas stations, 1% cash back on other purchases. The Blue Cash Everyday® Card from American Express is a good option for grocery shoppers who want to earn a high rate on purchases and also have a decent 0% intro APR period. The cash back you earn is at a great rate, and you have the chance to rid yourself of debt during the intro period. PayPal Here Review: How Does It Compare?